Yet another academic year has come and gone and with it a new class of Fashion students graduate. This year’s standard of BA collections was as high as ever, making it exceptionally hard to focus on key individuals. But we couldn’t help but be overly impressed, enthused and curious by a handful of students certainly set to take the industry in their stride… over to you Cara Wightman. Runner-up of the Eleanor Worthington prize for an earlier semester’s project, Cara Wightman had her graduate collection in the bag. Her looks meet the adrenaline and fashion needs of the millennial man meticulously. What was the basic path that your research took to form your final concept? My research firstly started very widely by exploring everything I could relate to adrenaline junkies e.g. extreme sports, crime, graffiti, extreme protesters etc. I also looked at historical and contemporary styles from other designers. 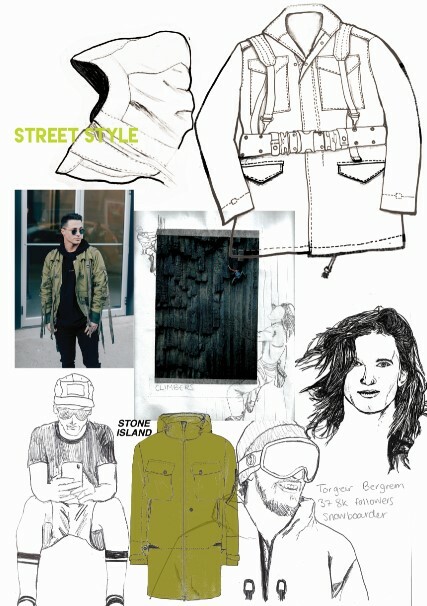 After this the idea for my brand started to form and I began looking more closely into certain topics, which included military wear, red bull and extreme sports. Did you go to any particularly inspiring exhibitions? Whilst I was completing my research there was actually a military exhibition on at Northumbria University, so I was able to look really closely and draw actual vintage military clothing. This was probably one of the biggest influences for me. I did also go to the Tyne and Wear archives where I was able to look at some historical garments. My initial idea firstly came from asking the question ‘why do people feel the need to take risks’. I have participated in skiing and snowboarding myself, but I only get the chance on holidays and I often let fear get in the way of progressing. I think the main idea for my collection came from the fact I would love to be fearless in this way as it’s amazing what someone can achieve when they have this mentality. 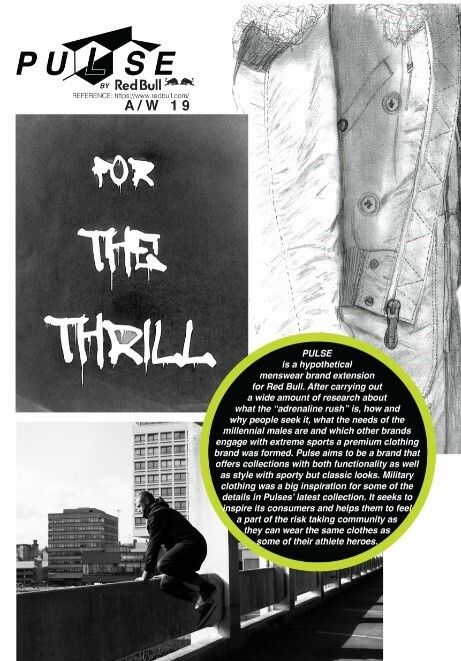 The whole point of the brand was to give, not only other like-minded adrenaline junkies a chance to be a part of something, but also for people who, even if they aren’t adrenaline junkies themselves, appreciate the bravery and determination it takes to participate in some of these activities. 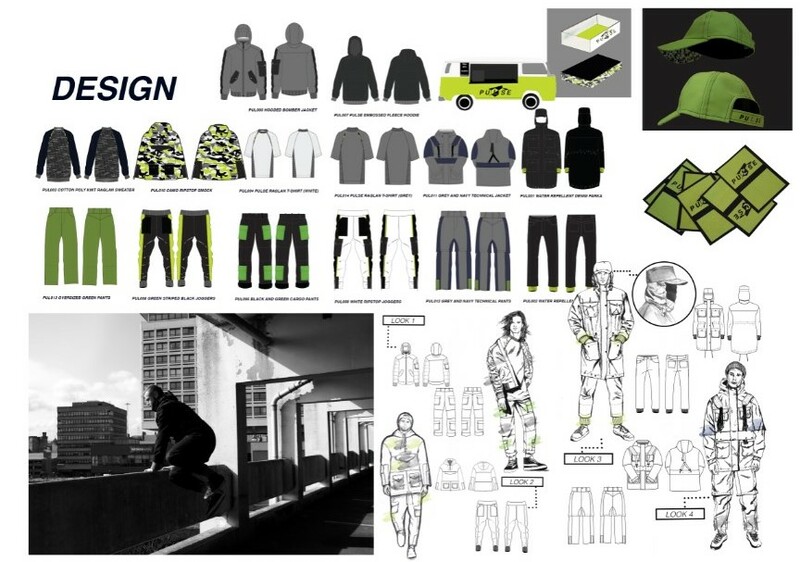 The idea was that the brand could allow the consumer to be like their hero through clothing. Why did you choose Red Bull as a hypothetical collaborator? I chose Red Bull, because when I think of the brand I think of adrenaline and extreme sports. I wanted people to have the same connection with my brand extension so it felt fitting to use them. They also sponsor many inspiring athletes and I wanted my brand to have inspirational figures for consumers to look up to. The idea then came that I could use the athletes Red Bull already sponsor as brand ambassadors. Did you specialise in the pattern cutting, print or 2D module the Northumbria Fashion Design and Marketing course offers in its final year? I specialised in pattern cutting, but also experimented with a little bit of digital printing (camouflage print) and knitting for the cuffs on my concept garment. 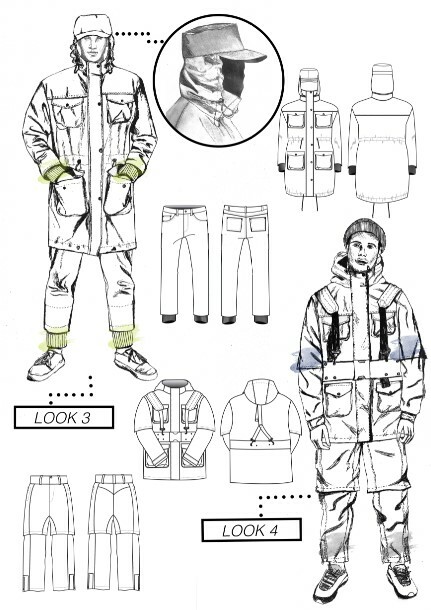 Were any specific pieces of military clothing particularly influential in your final collection? Three main pieces of military wear that were most influential within my final collection were the smock, parka and military cap. After drawing a military cap from the Northumbria military exhibition, I had the idea to incorporate this in my denim parka jacket designs. As this jacket is performance wear I wanted the cap/hood to be adjustable for however the consumer felt right for them. So it can be worn either as a hat, hood or tucked into the collar. The collar has a zipped welt pocket, and the hood flap has press-studs that attach to a band on the hat. I made the denim fabric of the parka waterproof and the lining is a cotton rip stop. What direction has producing this collection inspired you to take with your future career? 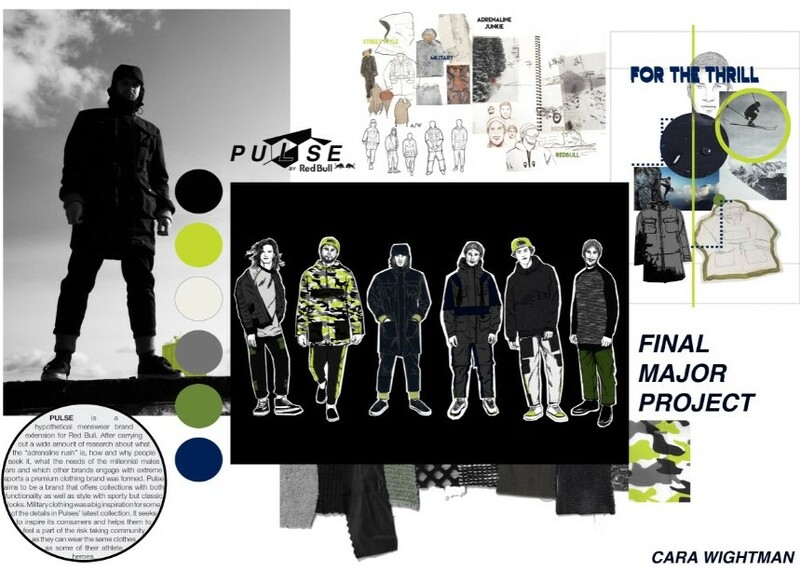 Fourth year confirmed that I definitely have a passion for menswear design, in particular sportswear and street wear. Final year also helped me to massively develop my skills in pattern cutting, as well as to understand different properties of fabric and performance wear.